Just in time for the New Year we have some nice new pictures for you from the upcoming and eagerly-awaited Harry Potter and the Half-Blood Prince. Click here to see very high-res versions of the images. The one thing I must always give the Harry Potter filmmakers credit for is their set design. For the scenes not involving green-screen backgrounds, the sets are pretty amazing and really give you the vibe and feel of the story’s environment. I think all of these screen caps are great except the one with Ron and Harry looking around the tree which is just ordinary. Either way, the movie should prove to be quite visually appealing as they seem to improve effects-wise with each successive installment. Now on to discussing the 7th installment to the Harry Potter series being split into two separate films... To me this is such a blatant money-grabbing scheme since they’ll probably be filming these movies back-to-back and leaving plenty of unnecessary scenes that would normally be cut out of a theatrical release (that is, if it were made as one film). On the other hand, the book is long and the more to see on the screen the merrier, especially if it meansdoing the full story justice. Then again, the third Lord of the Rings film was super long and they didn’t split that up to make more money…and they certainly could have if you saw how long the extended edition was for that. Interestingly enough, the cast of the Harry Potter movies were as surprised as we movie-goers and fans were about the splitting of the film into two. MTV spoke with Emma Watson who plays Hermione Granger and she expressed her confusion on the topic. Good point Emma! It will probably end in a non-satisfying cliff hanger. The countless folks who have read the book obviously know how the film will end up playing out, but from a theatrical perspective that’s a bit of a downer. Especially considering the potential delays and amount of time between the debuts of the two halves of the film. What do you think of the images? How do you feel about Harry Potter and the Deathly Hallows being split into two films? 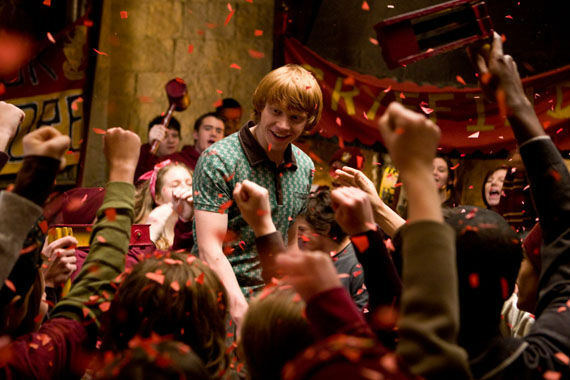 Harry Potter and the Half-Blood Prince should hit theaters July 17 2009.